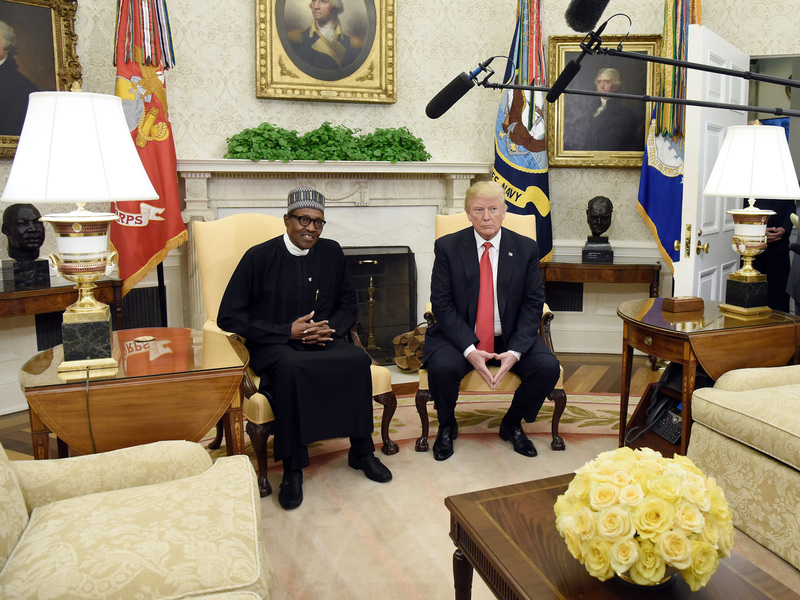 Why Nigerians Liked (And Criticized) The Trump-Buhari Meeting : Goats and Soda Trump's reference to the killing of Christians was a particular flash point in the conversations on the street and on Twitter. President Donald Trump meets with Nigerian President Muhammadu Buhari in the Oval Office of the White House on April 30. While Americans are busy dissecting the Michelle Wolf monologue at the White House Correspondents' dinner, Nigerians (and experts on Nigeria) are busy expressing themselves about Monday's meeting with President Trump and their president Muhammadu Buhari. It's the first time Trump has met with a sub-Saharan African leader. Here's a roundup of responses, from interviews with Nigerians and other commenters and from Twitter. Some are glad the meeting took place. "I am really excited about the recent developments, and I believe it's a way of strengthening relationship between both countries," says writer Divine Nwoye. Others are not fans of the U.S. President, especially in light of his reported use of a vulgar term to characterize African nations in January 2018. Desmond Okon, political commentator and resident of Lagos: "He's a controversial human being who has a reputation for offensive comments. [Our] President should be careful with the things he says to avoid selling the country out." Osita Obeta, who just joined he National Youth Service Scheme for the one-year mandatory stint: "I've always loved Trump and his frankness when it comes to talking about issues, and his stance on the senseless killings in Nigeria is a good one. Leaders should not shy away from calling a spade a spade." ... but others are skeptical. Some wonder why Trump only mentioned one group that's suffering. It is unfortunate that forces opposing Buhari have become desperate enough to make what is happening in Nigeria look like ethno-religious cleansing. But yes, killings must stop, not just of Christians but of everyone! We don't want anybody from outside drawing lines between us. Trump just labelled the killings in Nigeria as the "KILLINGS OF CHRISTIANS". And some are wondering about visas to immigrate to the U.S. There's a call for action, not just talk. Victor Ejechi, a recent graduate of the University of Benin who lives in Lagos: Trump's remarks needs to be acted upon before we can have a full-blown celebration. Rhetoric statements on fighting human trafficking, corruption and insecurity don't solve problems. I hope Buhari returns to Nigeria energized to take serious actions on what he discussed with Trump." They're glad that corruption was mentioned but aren't certain change is coming. Ejechi says Buhari's war against corruption has not produced "good results": "What have we done with all the recovered money? Has anybody been jailed for corruption?" Obeta has a different perspective: "Buhari has partly tried to eliminate corruption, but the people he is working with have not made it easy for him." Merit Ayibe, a journalism student: "I am happy they discussed trade because Nigeria needs to attract more investment rather than aid for real development to happen." They have mixed feeling about U.S. aid. Ayibe: "No country can develop by depending on aid. Most of the aid we've collected in the past were not used well, in fact they could provide basic facilities that would address issues like malaria." Okon: "Aid is good, but the question is what is the catch? What is the motivation behind it? If the agreement is safe after all considerations then I don't have issues with it." They speculate about why the meeting was held in the first place. Matthew T. Page, former State Department official and associate fellow at Chatham House: "Left to his own devices, I think President Trump would have minimal interest in meeting with President Muhammadu Buhari or any other African leader. This meeting is most likely the result of efforts by diplomats and other policymakers from both countries to bring together these two leaders to reaffirm the close — if not occasionally challenging — relationship between the United States and Africa's largest economy and most populous country. The meeting offers presidents Buhari and Trump — both of whom are politically polarizing figures in their respective countries — the opportunity to appear engaged, statesmanlike and in control."